(Newser) – The Tea Party movement continues to make its presence felt on Capitol Hill, but its influence over the American people is on the wane. A new Gallup poll shows support for the movement nearing an all-time low at 22%, compared to 27% who oppose the movement. Those who oppose the movement also feel more strongly about it than those who support it, the numbers show. But perhaps the more surprising finding is that the Tea Party and Republican Party aren't exactly synonymous. The Tea party sees the GOP and Democrat Light. Term limits would solve most of our problems. Most who hate the Tea party hate this country and are freeloaders or like the Hollywood elite. We are Bankrupt, Bancarota, Broken and Kapput! And you people are totaly unaware!!! 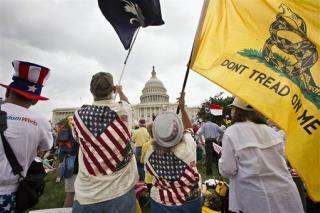 The Tea party should stop being the immature destructive cowards they are and step up and form their own party. The side effect of a permanent Democrat majority is just a side effect for their bravery.